Vintage Round Diamond Engagement Ring in 14k White Gold | Shane Co. This chic and classic engagement ring features eight round diamonds, at approximately 1.05 carats total weight. Each sparkling gem has been hand-matched for brilliance and sparkle. The diamonds are complemented by a shimmering 14 karat white gold vintage inspired setting with unique cutout detailing at the profiles. 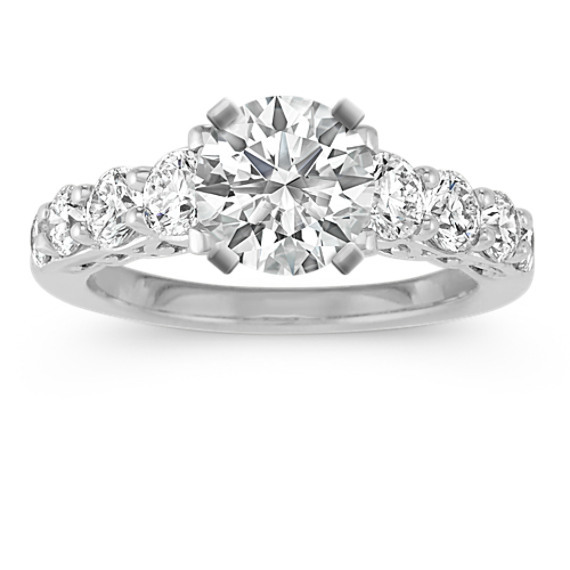 Simply add the center diamond of your choice to personalize the look. The ring is 5.5mm at the center and 2.5mm at the band.